Chromebook fanciers on both sides of the Atlantic can now get their hands on a Toshiba-made system, after it went on sale a little earlier than expected. Announced at CES 2014, the 13.3-inch Toshiba Chromebook is available for £249 in the UK and is officially priced at $300 in the United States, although Amazon is selling it for $20 cheaper. The new Chromebook, which wasn't due to go on sale until later this month, has a 1366 x 768 display resolution and is powered by Intel's power-efficient Haswell processors. 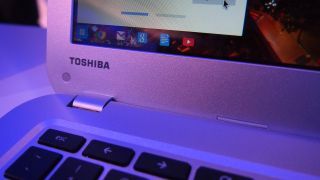 Toshiba's model also brings 16GB of internal storage, 2GB of RAM, an estimated battery life of 9 hours, plus all the usual connectivity tools. Chromebooks appear to be gaining more and more momentum, with strong Christmas sales, an increasing influence in the education market and manufacturers boosting their output. Just last weekend, Chinese PC-maker Lenovo launched a pair of Chromebooks, including a flexible laptop/tablet hybrid under its ThinkPad Yoga brand. Are you thinking of snapping up a Chrome OS-powered device for your next laptop. Tell us which model you have your eye on in the comments section below. Read our Toshiba Chromebook review right here!